Crisis! Apparently we hadn’t made enough custard to fill the giant dish. 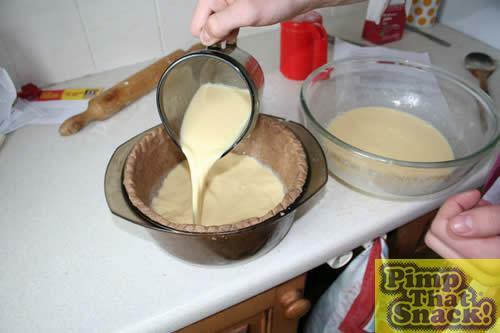 A quick run to retrieve the necessary ingredients for custard making, and one extra helping of custard to fill the tart to the top was on its way. Second Crisis! Decided to take the pie out of the oven to test the custard .but due to some slight handling discrepancies (READ: Almost dropping it. 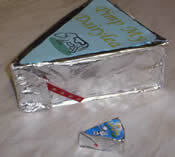 ), a significant portion of our custard departed the dish to its new home on the floor. Was this the end of the tart? Back in the oven, and out again a short while later. 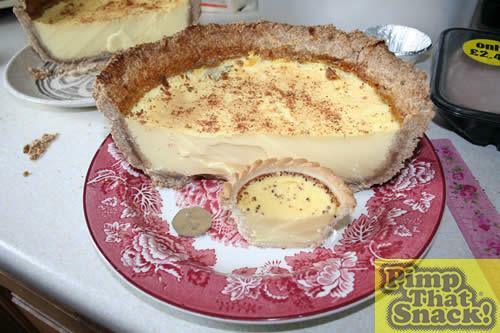 The custard had literally risen to the challenge, and expanded to fill up the tart case. Looking rather nasty, with a large brown blob on one side of the skin, we removed this top layer to reveal some rather nice looking custard underneath. 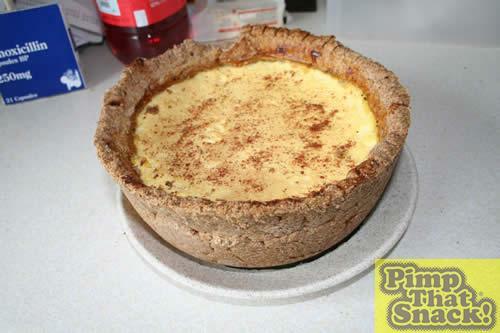 Some nutmeg sprinkled on top, and then in the fridge for the custard to set, and a wait until the next day. 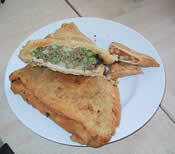 The next day, the monster was ready to be removed from the dish. By a rather ingenious method involving two knives, three plates and an elastic band, the task was accomplished. The final task, the taking of weights and measurements, and a comparison with the original. Value for money – at 1800g for 308p, that makes an incredible 5.84 grams per penny, or 0.17p per gram. Doesn’t taste half bad too. 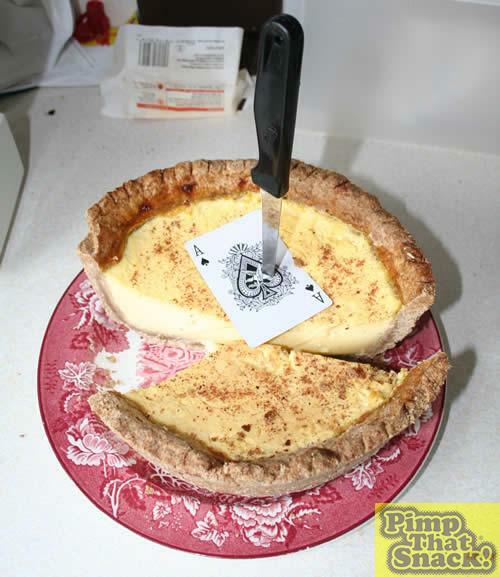 The most pimped custard tart to grace the planet.